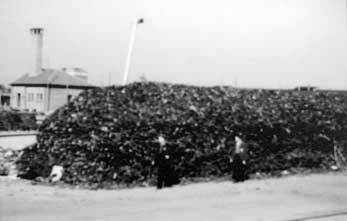 A S Marques has received an interesting photo from an Australian film maker of a mound of shoes at the Neuengamme concentration camp, Sunday, June 5, 2005. Gradually the wartime propaganda legends dissolve. Dear Sir, I read your remarks to David Irving about the piles of shoes in the camps. I am an Australian Filmmaker and 2 weeks ago I was filming in Neuengamme Camp and found an interesting Photo of a huge pile of shoes...I've attached it to this letter. The Caption to the photo [click for image] says: "British Forces entering the Camp [in 1945] discovered a large pile of shoes. At first it was assumed the shoes had belonged to those murdered in the Neuengamme or Auschwitz concentration camps. In fact these shoes were the product of a 1943 collection in Hamburg. The Neuengamme camp acted as a colelction point for these shoes which were taken apart here or requisitioned by factories for their workers." I take the liberty of forwarding the above message that you sent to me, with the photo and caption attachment, to David Irving, who wrote on his website that "We do know that outer clothing including footwear was routinely removed from the bodies of German air raid victims, including thirty tons of clothing from those killed in the Dresden air raid alone, and turned over to recycling agencies." David Irving first comments on the mountains of shoes. "We have no real idea where the ones on display at the Auschwitz tourist center came from, forensically speaking."